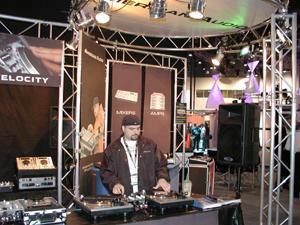 LDI 2002, the largest US conference and trade show for the entertainment technology industry, which included audio, lighting and video projection professionals, attracted an even larger than anticipated crowd of visitors to the Las Vegas Convention Center on Oct. 18-20, 2002. Fueled by exciting advances in technology displayed by over 350 exhibitors on the show floor and an "over-the-top" conference program, visitors and exhibiting companies expressed their elation with the show. In addition to the regular conference sessions in entertainment lighting, professional sound, architectural lighting and production techniques, visitors were able to attend four days of intensive full-day classes at the LDInstitute . LDI vendors and visitors alike are exceptional in that they work in some of the world's most recognized live entertainment venues including theme parks, theatres, churches, special events, casinos, concerts and live productions. A panel of industry experts has selected the winners of the annual LDI Awards for excellence in the field of entertainment design and technology. Winners are selected from among LDI exhibiting companies and individual designers worldwide. The 2002 LDI Awards are the entertainment technology industry's highest accolade. Click here to read the complete list of winners. This year, the show began to broaden its focus to include a wider range of products and technologies on the exhibit hall floor and in the conference sessions. Industry trends towards integration of audio/projection and lighting have caused the show to expand its focus. The Entertainment Technology Show - LDI and Beyond is the only US trade show and conference dedicated to attracting professionals across disciplines in the art and technology of live venues and fixed installations. Product applications are used in theatre, houses of worship, theme parks, concerts and other live events, dance clubs, museums, restaurants, casinos, and other places where you see and hear "entertainment technology". The Entertainment Technology Show - LDI and Beyond will guide you through the maze of new technologies, new products, and new ways of doing business. Conference programs offer practical, applications-oriented instruction and technology-rich exhibits showcase equipment and services. Be sure to visit the Virtual Booths if you missed anyone at the 2002 event! The Entertainment Technology Show 2003 (ETS) features LDI (Lighting Dimensions International), ADI (Audio Dimensions International), and PDI (Projection Dimensions International), and will feature Staging, Rigging, and Special Effects.